Defending series champion Joey Logano topped the speed chart during the first on-track action of the 2019 Monster Energy NASCAR Cup Series season, but it was a rough start for Chase Elliott, Denny Hamlin, Kevin Harvick and Ryan Newman. 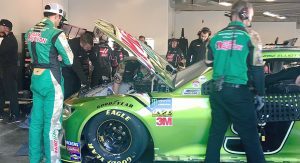 With roughly 45 minutes remaining in what served as the only practice for Sunday’s Advance Auto Parts Clash at Daytona (3 p.m. ET, FS1, MRN, SiriusXM NASCAR Radio), Elliott’s No. 9 Hendrick Motorsports Chevrolet Camaro drifted up into Ryan Newman’s No. 6 Roush Fenway Racing Ford Mustang, triggering a four-car scramble. Elliott was able to drive his car back to the garage, but the team has elected to go to a backup for tomorrow’s race. Hamlin received the most significant damage as his No. 11 Joe Gibbs Racing Toyota Camry slammed nose-first into the outside wall, while Harvick spun into the grass trying to avoid the incident. In a collective effort between NASCAR officials and the Nos. 4 and 6 teams, Harvick and Newman were able put four new tires on their cars as they sat on the backstretch during the red-flag period, driving their machines back to the garage with minimal damage. Logano recorded a fast lap of 196.786 miles per hour in the No. 22 Team Penske car, putting the new Ford Mustang at the top of the leaderboard in its official 2019 debut. Jimmie Johnson finished the session in second with a lap of 196.674 mph, while Austin Dillon (196.622 mph), Elliott (196.580 mph) and Harvick (196.511 mph) rounded out the top-five speeds. The session was extended by five minutes due to the extended red flag.